This year marked the first time that the Best Picture category had only eight nominees. 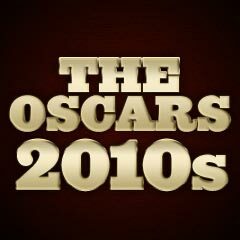 Ever since 2009 when the Best Picture field could be between 5 and 10, there had always been nine contenders. For Oscar predictors, every Best Picture winner in the past 60 years has also been nominated in a screenplay category - except for The Sound of Music (1965) and Titanic (1997). In this year, the winning Best Picture won in both categories. Up to the time of the nominations, the eight nominees grossed only $205.2 million collectively - the lowest since 2009 (the previous low was in the year 2011, at $519 million). This was the first time since 2007 that no Best Picture-nominated film collected $100 million domestically by the time nominations were announced. Most of the films were underperforming, art-house independent films. The Grand Budapest Hotel was the top grossing Best Picture nominee (at $59.1 million domestically), mostly because it was released in March of 2014. At the time of the awards, the only major Hollywood mainstream film, Warner Bros.' American Sniper (with six nominations - and only one Oscar win) was the top grossing film at $316.2 million. It had a tremendous boost of over $300 million from the time of the nominations. Half of the eight finalists for Best Picture were biopics - they were mostly tales of lone-heroes (some Great Men) who were on journeys searching or striving for something seemingly unreachable. director Wes Anderson's off-beat historical comic drama The Grand Budapest Hotel (with 9 nominations and 4 wins, including Best Production Design, Best Costume Design, Best Makeup and Hairstyling, and Best Original Score). It was also represented by Fox Searchlight Pictures. 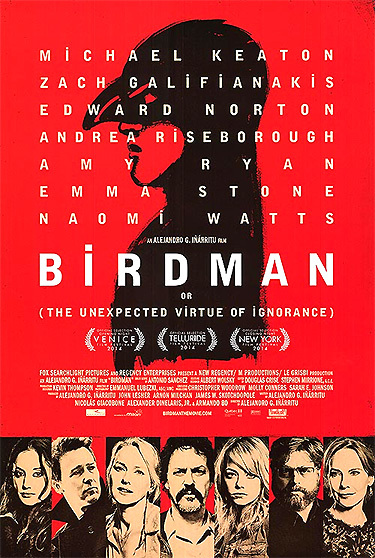 It was the Best Motion Picture (musical or comedy) at the Golden Globes, although it had no acting Oscar nominations. director/writer Damien Chazelle's (and Sony Classics) directorial debut film, the musical drama Whiplash (with 5 nominations and 3 wins, including Best Supporting Actor, Best Film Editing, and Best Sound Mixing). It told about a domineering music conservatory teacher (Oscar winner J.K. Simmons) and his torturous relationship with one aspiring student (a jazz drummer). director Morten Tyldum's (and the Weinstein Company's) biopic about British code-breaking cryptographer Alan Turing during WWII, The Imitation Game (with 8 nominations and only one win, for Best Adapted Screenplay (based upon Andrew Hodges' 1983/2000 biography)). director/writer Richard Linklater's innovative coming-of-age indie film Boyhood (with 6 nominations and only one win, Best Supporting Actress). It was filmed over 12 years about a boy's (Ellar Coltrane) journey to adulthood. director Clint Eastwood's Navy SEAL war drama about a deadly sniper, American Sniper (with 6 nominations and only one win, Best Sound Editing). It was based upon the 2012 best-selling autobiographical memoirs of real-life lethal US Navy SEAL sniper Chris Kyle who went on four tours. This was the first time that one of Eastwood's directorial efforts had been nominated for Best Picture but not also for Best Director. director James Marsh's and Focus Features' biopic The Theory of Everything (with 5 nominations and only one win, Best Actor), about Stephen Hawking (based upon wife Jane Hawking's 2008 memoir Travelling to Infinity: My Life With Stephen). director Ava DuVernay’s Selma (with only two nominations and only one win, Best Original Song, "Glory"), distributed by Paramount Pictures. It was a biopic about the famed voting rights march (seen over a 3-month period) led by civil rights leader Dr. MLK (David Oyelowo) from Selma to Montgomery, Alabama in 1965 which spurred President Lyndon B. Johnson (portrayed by Tom Wilkinson) to pressure Congress to pass the Voting Rights Act of 1965. In the Best Director category, four of the directors of Best Picture nominated films were missing from the directorial nom lineup, including Clint Eastwood, Damien Chazelle, Ava DuVernay, and James Marsh. Bennett Miller, the director nominated for Foxcatcher, was the first director (since the Best Picture category was expanded) to score a spot for a film that was not also nominated for Best Picture. 84 year-old Clint Eastwood (with his 11th career nomination this year) would have been the oldest Best Director nominee ever, if he had received a directorial nod for American Sniper. 51 year-old Mexican film-maker Alejandro Gonzalez Inarritu (with his fourth Oscar nomination, and first Oscar win), for Birdman. The film was a miraculous feat - it appeared to be comprised of a single, seamless, unbroken shot. He was the second consecutive Latino (Mexican) director to win after Alfonso Cuaron last year for Gravity (2013). Every single nominee in the performance categories (20 in all) were white, raising again the diversity question for the Academy. There were no non-white contenders for the first time since the Oscars honored the films of 1995. [Note: this was only the second time in 14 years that the Academy nominated no actor or actress of African heritage.] Also, this year's Oscars saw five directors, five cinematographers and 14 screenwriters nominated, all men - the first time since the 1999 Oscars. One of the more notable omissions was a nomination for Gillian Flynn's adaptation of her own 2012 best-selling novel for Gone Girl. Nine out of 20 performers in the acting categories were first-time nominees. Five of those nominated were British performers. Only four of this year's acting nominees had won Oscars before: Marion Cotillard, Robert Duvall, Meryl Streep and Reese Witherspoon, and none of them repeated with a win this year. All four performance Oscar winners were first-time winners, and were widely predicted: Eddie Redmayne in The Theory of Everything, Julianne Moore in Still Alice, J.K. Simmons in Whiplash, and Patricia Arquette in Boyhood. 33 year-old Eddie Redmayne (with his first career nomination and first Oscar win) as Cambridge University cosmologist and theoretical physicist Stephen Hawking (in his later years) who was diagnosed with ALS in 1963, in the biopic/love story The Theory of Everything. Redmayne's win was the 7th instance in the past ten years that the Best Actor Oscar has been awarded to someone playing a real-life person. Films that were not nominated in the category included: Disney's musical Into the Woods (with only 3 nominations and no Oscar wins) - a retelling of numerous fairy tales, Foxcatcher (with 5 nominations and no Oscar wins), Angelina Jolie's epic Unbroken (with three minor nominations and no wins) - her second feature film as director, a true story about valiant WWII bombardier Louie Zamperini's (Jack O'Connell) struggle to endure as a POW after his plane was shot down by the Japanese, Dan Gilroy's portrait of a sociopath in Nightcrawler (with only one nomination for the director's Original Screenplay), and writer/director J.C. Chandor's 1981 NYC period drama A Most Violent Year (with 0 nominations total). And Gone Girl was snubbed in the Best Picture and Best Screenplay categories, receiving only one nomination for Rosamund Pike as Best Actress. Director Christopher Nolan's Interstellar had five nominations (all secondary): Production Design, Score, Sound Editing, Sound Mixing, and Visual Effects (its sole win). Although bypassed for Best Picture, Foxcatcher became one of the most-nominated sports films in film history, with five (but did not win a single Oscar). Ava DuVernay’s moving MLK biopic Selma received only two nominations, Best Picture and a sole Oscar win for Best Original Song (Common and John Legend's recent Golden Globe-winning song "Glory"), while the director did not receive a nomination in the Best Director category - she would have been the first African-American female to be nominated. It appeared that director Bennett Miller's nomination for Foxcatcher in this category (but not a Best Picture nod) took DuVernay's spot for Selma. Also not in the list of directorial nominees: Angelina Jolie for the drama Unbroken about a 1936 Olympian world-class runner who became a Japanese prisoner during World War II, Damien Chazelle for Whiplash, James Marsh for The Theory of Everything, and Clint Eastwood for American Sniper. British-Nigerian actor David Oyelowo was denied a nominaton for his role as Martin Luther King Jr. in Selma. Other actors who missed out in this category were Ralph Fiennes as the hotel's devoted concierge Monsieur Gustave H. in The Grand Budapest Hotel, Jake Gyllenhaal as creepy news-camera man Louis Bloom in Nightcrawler, and Timothy Spall as cantankerous, Victorian-era English seascapes painter J.M.W. Turner in UK director Mike Leigh's biographical Mr. Turner (with a total of four nominations and no wins), and Brendan Gleeson as rural Ireland's questioning Catholic Father James in British writer/director John Michael McDonagh's religious drama Calvary. Jennifer Aniston was edged out for her performance as chronic-pain-suffering, car-accident-survivor Claire Bennett in director Daniel Barnz' Cake, by the unexpected nomination for Marion Cotillard in Luc and Jean-Pierre Dardenne's foreign language film Two Days, One Night. Amy Adams (with five career nominations) was snubbed for her lead role as painter Margaret Keane (of large-eyed waifs) whose husband took credit for her work, in Tim Burton's Big Eyes (shut out of nominations), as was Hilary Swank as strong-willed pioneer woman Mary Bee Cuddy in Tommy Lee Jones' western The Homesman, and Emily Blunt as the Baker's Wife in Into the Woods. Nominated Marion Cotillard's best role of the year was as newly-arrived immigrant prostitute Ewa Cybulska in writer/director James Gray's historical drama-romance The Immigrant (2013, UK), not the film she was nominated for. Josh Brolin for the 1970s LA cop drama Inherent Vice (with only two nominations, including Best Adapted Screenplay, and no wins), two actors from Selma (Henry Sanders and Tom Wilkinson), and Albert Brooks as lawyer/consigliere Andrew Walsh in J.C. Chandor's A Most Violent Year, were missing from the five nominees. Laura Dern's nomination as Cheryl's mother Bobbie in Jean-Marc Vallée's Wild (her second career nomination) was a surprise nod, nudging out Jessica Chastain as scheming wife Anna Morales of Abel (Oscar Isaac) in A Most Violent Year. Three other possible nominees in the category might have been Rene Russo as Louis Bloom's (Jake Gyllenhall) TV-news abettor Nina Romina in Nightcrawler, Vanessa Redgrave as John du Pont's (Steve Carrel) cold-blooded mother Jean in Foxcatcher, and Imelda Staunton as Hefina in director Matthew Warchus' Pride. The biggest surprise of all was that the blockbuster domestic hit, The LEGO Movie wasn’t nominated in this category (it had a sole nomination for Best Original Song: "Everything is Awesome") - it was edged out by the unreleased Song of the Sea. In addition, Steve James' documentary about film critic Roger Ebert, Life Itself, was not nominated in the category. Twenty years earlier, the same director was controversially denied a nomination for Hoop Dreams (1994).